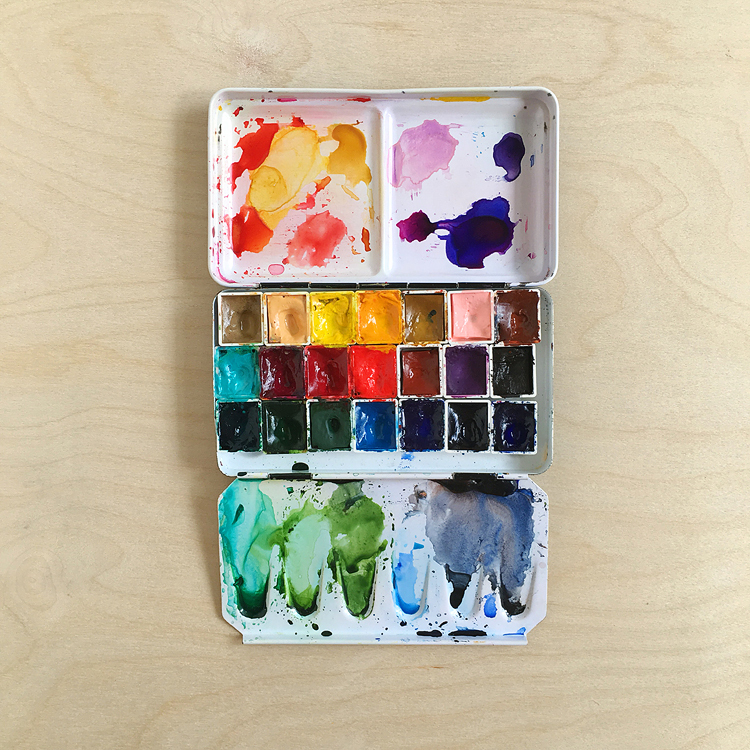 I love using watercolor crayons so I thought I’d share what I’ve learned about them in the next few posts. For those who’ve never heard of a watercolor crayon, I’d describe them as very soft crayons that are activated like watercolors by water. You can draw on paper with them and then go over the marks with a wet brush, wet a brush and pick up color from the crayon that way, and you can also color directly on a rubber stamp with them — that’s what I’m going to describe in this post! I’ve found that more crayon “sticks” to the stamp and you get better color depth if you start off by wiping your stamp with a wet paper towel or baby wipe. After the stamp is damp, color all over the rubber with the crayons. You can pile one color on top of another — here I used two greens on the leaves, pink and purple on the flower petals, and light orange, dark orange, and brown on the cone of this coneflower. I put the darker colors along the edges. Note — you can click on any of these pictures to see them larger. Next give the stamp a good misting with a water mist bottle — I usually give it a good 7-10 mists. Hero Arts has a great water bottle for this, or you can use any water bottle that sprays a fine mist. Just don’t do what I did — the first time I tried this technique I used the water bottle I use when ironing clothes — the water droplets came out too big and made blobs all over the stamp — didn’t work at all! You want the stamp to be completely covered in fine beads of water — more is better than less! The main tricks here are to keep the stamp level so that the colors don’t run, and let the mist gently fall on the stamp — don’t spray it directly. I hold the stamp in my left hand and spray with my right — this way I can easily move the stamp under the mist. I keep my hands about 18 inches apart. Now flip the stamp over and stamp it on heavy cardstock or watercolor paper — again, keep the stamp level — don’t tilt the stamp when you’re figuring out where to position it on the paper or the colors will run together — or right off the stamp! I like to use “hot press” watercolor paper because it’s smooth and the details of the stamp show up well. Once again, Hero Arts has some awesome watercolor paper. I’ve also found that Fabriano hot press watercolor paper works great — you can get it in tablets where the edges are all stuck together so that the paper doesn’t warp as it dries. You can also get large sheets of hot press watercolor paper at Michael’s — it’s over by the posterboard. You can keep misting and stamping at least 3 times before you have to add more crayon to the stamp. This picture of the stamp was taken after misting and stamping 3 times, and I think I could probably get another 2 good images out of it. You can add color right to the stamp when it’s at this stage if you like and keep on going, or you can clean it off and start over — just depends on how neat you want to be! Experiment and have fun! My next post will be more things you can do with watercolor crayons. Supplies: Hero Arts watercolor coneflower (F3854 ), thanks a bunch (LL084), watercolor paper (PS439 ), pink notecard (PS424), and water mist bottle (WM101). Ribbon by American Crafts. Green paper layer by Bazzill. Ancient Page Chocolate ink (for the saying). I’ve only tried Lyra Aquacolor watercolor crayons — I got mine at Jerry’s Artarama. If you have Lyra Aquacolors, the numbers I used are: 13076, 13070, 13068, 13034, 13028, 13015, and 13013. Can you use this same technique with polymere stamps? 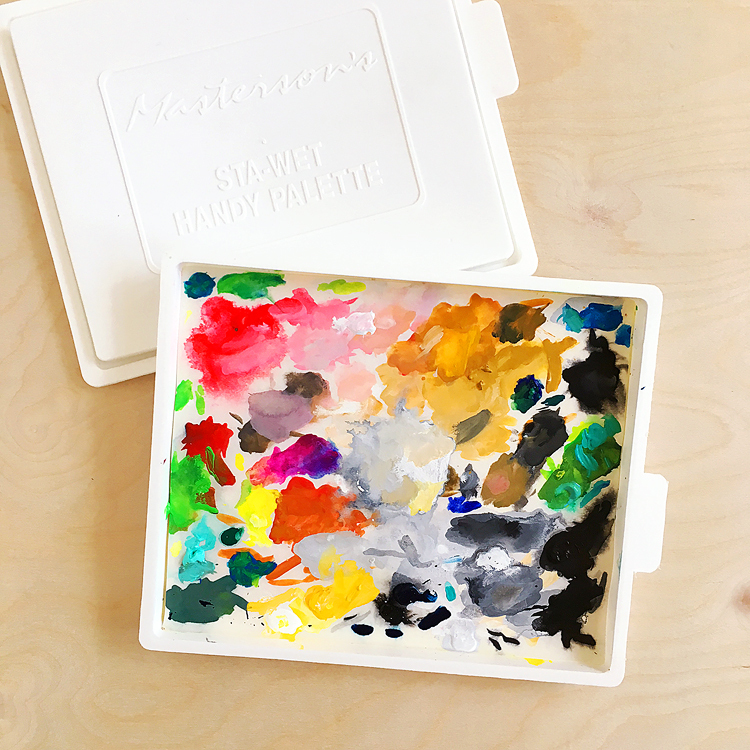 With your regards to using watercolor crayons with polymer stamps — yes, you sure can use them. However, it’s a little bit tricker as when you mist the stamp with water, the crayon may bead up more depending on the manufacturer’s polymer formula. Stamps made in the USA work better for this. I am going to get me some watercolor crayons! This is a beautiful technique, thanks for sharing this! Your card is beautiful. Thank you for sharing all these tips. Thank you for sharing this technique. I will have a go . Great tutorial… Thanks so much. Beautiful. Do you keep stamping the same image or do you mean that you get a few more different stampings from the stamp. Thank you.